In May, 2004, Edge published Danny Hillis's essay in which he proposed "Aristotle": The Knowledge Web. "With the knowledge web," he wrote, "humanity's accumulated store of information will become more accessible, more manageable, and more useful. Anyone who wants to learn will be able to find the best and the most meaningful explanations of what they want to know. Anyone with something to teach will have a way to reach those who what to learn. Teachers will move beyond their present role as dispensers of information and become guides, mentors, facilitators, and authors. The knowledge web will make us all smarter. The knowledge web is an idea whose time has come." 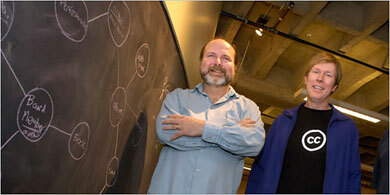 Danny Hillis, left, is a founder of Metaweb Technologies and Robert Cook is the executive vice president for product development. He says his latest effort, to be announced Friday, will help develop a realm frequently described as the "semantic Web" — a set of services that will give rise to software agents that automate many functions now performed manually in front of a Web browser. The idea of a centralized database storing all of the world's digital information is a fundamental shift away from today's World Wide Web, which is akin to a library of linked digital documents stored separately on millions of computers where search engines serve as the equivalent of a card catalog. ... In its ambitions, Freebase has some similarities to Google — which has asserted that its mission is to organize the world's information and make it universally accessible and useful. But its approach sets it apart. "As wonderful as Google is, there is still much to do," saidEsther Dyson, a computer and Internet industry analyst and investor at EDventure, based in New York. "In the middle there is something that represents things as they are," she said. "Something that captures the relationships between things." [W. DANIEL HILLIS:] In the spring of 2000, while I was writing the Aristotle essay, Jimmy Wales and Larry Sanger began taking a much more practical approach to a similar problem. Their project, called Nupedia, was an attempt to create a carefully edited encyclopedia of the world's knowledge that would be available to anyone, for free. The Nupedia project made some progress, but the going was slow. About a year later, they put a wiki on the web, allowing anyone to contribute feed material to Nupedia. That feeder project was called "Wikipedia". What happened next is a piece of History that should make us turn-of-the-millennium humans all feel proud. While all this was going on, I continued to plug away, trying to build a prototype of the more structured, computer-mediated knowledge base that is described in the essay. Comments from my friends, including those posted on Edge, helped me realize that trying to build a tutor and a knowledge base at the same time would be biting off way too much. So, I decided to concentrate on the "Knowledge Web" part of the problem. Even that seemed to be an uphill battle, because the collapse of the dot-com boom dimmed the funding prospects for all things connected. It was not a good time for ambitious ideas. Or maybe it was a good time. It was during this period, undistracted by the frenzy of a boom, that Google and Wikipedia were able to build spectacularly ambitious tools that made us all smarter. Eventually, their success reminded everyone that the information revolution was just beginning. There was renewed enthusiasm for ambitious dreams. This time, I was better prepared for it, having met, during the interim, a great product designer (Robert Cook) and a great engineer (John Giannandrea), both of whom shared the dream of building a connected database of human knowledge that could be presented by computers, to humans. John, Robert and I started a project, then a company, to build that computer-readable database. How successful we will be is yet to be determined, but we are really trying to build it: a universal database for representing any knowledge that anyone is willing to share. We call the company Metaweb, and the free database, Freebase.com. Of course it has none of the artificial intelligence described in the essay, but it is a database in which each topic is connected to other topics by links that describe their relationship. It is built so that computers can navigate and present it to humans. Still very primitive, a far cry from Neal Stephenson's magical storybook, it is a step, I hope, in the right direction.